Who loves making a meal and then having enough leftovers to make another delicious meal? 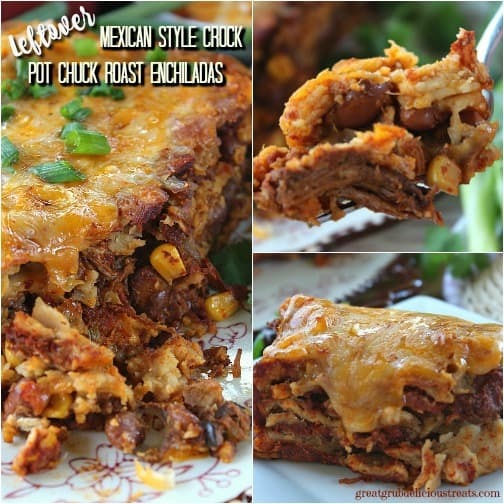 You are definitely going to want to try these leftover Mexican style crock pot chuck roast enchiladas then! 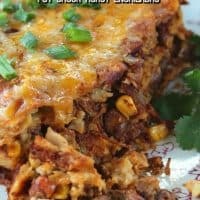 Just make the Mexican Style Crock Pot Chuck Roast first and then you will have enough leftovers to make these deliciously tasting enchiladas! 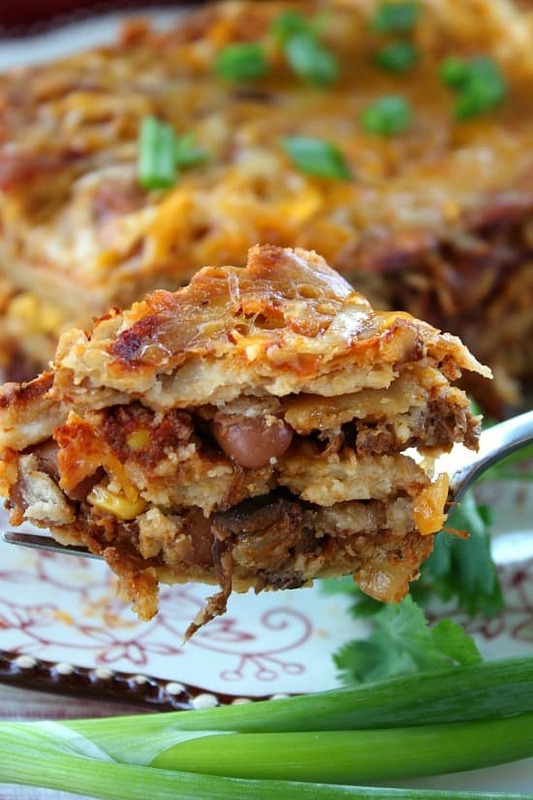 Seriously, these enchiladas are soooooooooo delicious! One of the best tasting enchiladas I’ve ever had! I’m always making different styles of enchiladas and I’d have to say, these are my favorite and the most delicious! Just look at how delicious these look! 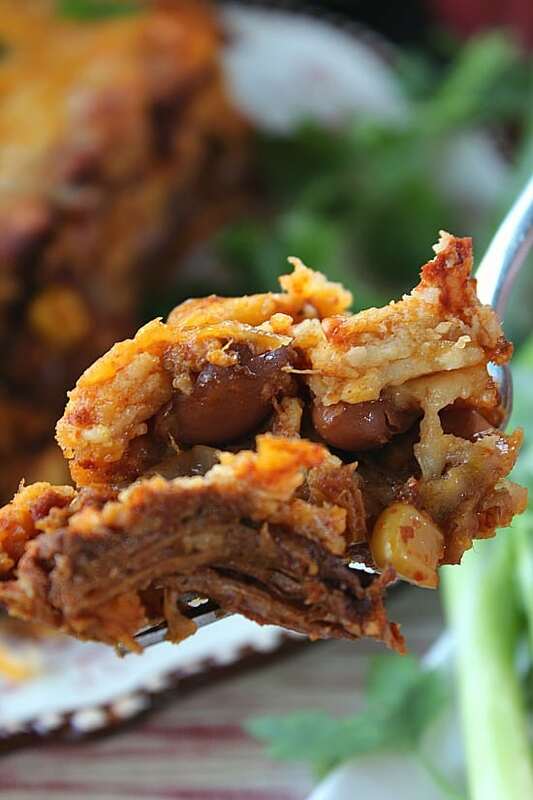 And, if you still have roast leftover, even after making these leftover Mexican style crock pot chuck roast enchiladas, make burritos for another weeknight meal! 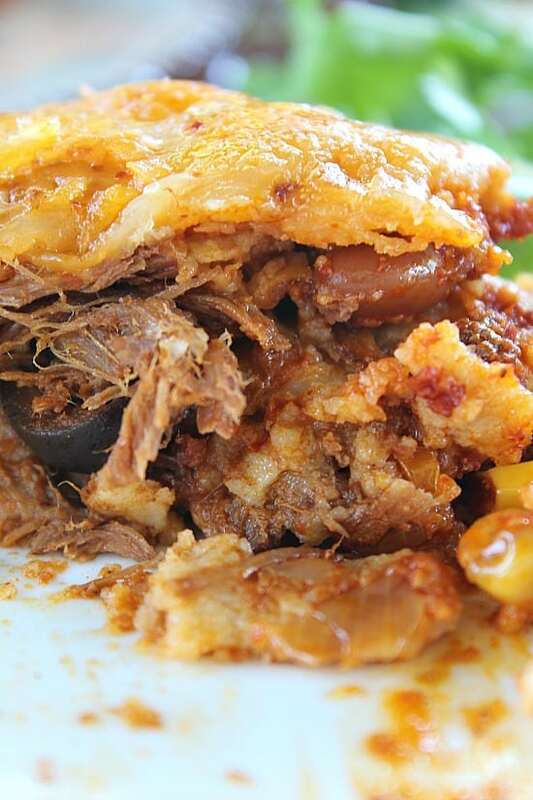 So many things to make with one great crock pot meal! The convenience of layering the ingredients makes preparation a snap! The hard part of making the meat is already done… well, cooking anything in the crock pot isn’t hard, but you get what I mean. 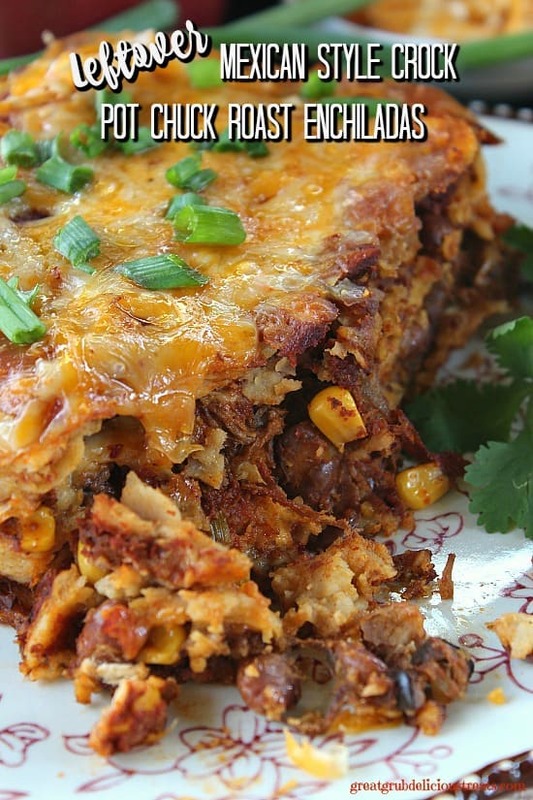 I honestly doubt you will have any leftovers of these awesome tasting enchiladas! If you do, they won’t last long. We even eat these up for breakfast, they’re that good! 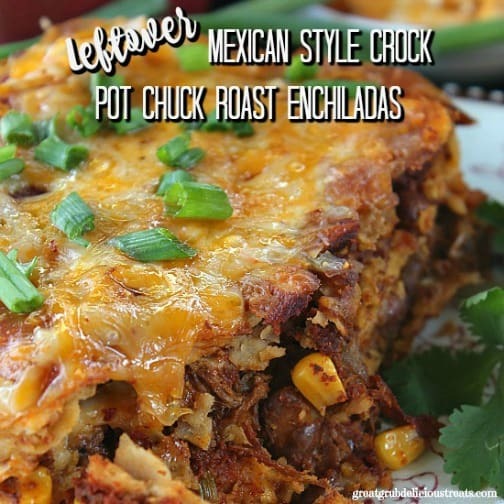 So go grab yourself a nice big chuck roast from your freezer, or from the store, gather up all the ingredients and get ready to enjoy a couple amazingly delicious, super easy meals that everyone will LOVE! Try this delicious tasting recipe today! In a 5-6 quart crock pot, add chopped onions to the bottom. Add roast and top with seasoning. Pour Rotel®, diced green chilies and enchilada sauce over roast. Cover and cook on low for 8-10 hours or high for 6-8 hours. Add pinto beans, corn and ¾ of the black olives into crock pot the last hour of cooking. Spoon into serving bowls and top with cheese. Preheat over to 350° and spray a 13 x 9 baking dish with non stick spray. Set aside. In the prepared baking dish, add some enchilada sauce to the bottom of the dish. 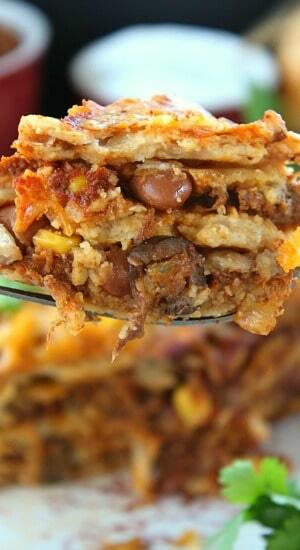 Place a layer of tortillas on top of enchilada sauce. Spoon left over Mexican Style Crock Pot Chuck Roast to cover the tortillas (heating up the meat a little bit in the microwave first will make preparing these enchiladas easier). Next, cover meat with grated cheese. Add another layer of corn tortillas, meat, cheese, then pour some more sauce over the top. Last layer will be tortillas, remaining enchilada sauce, then topped with cheese. 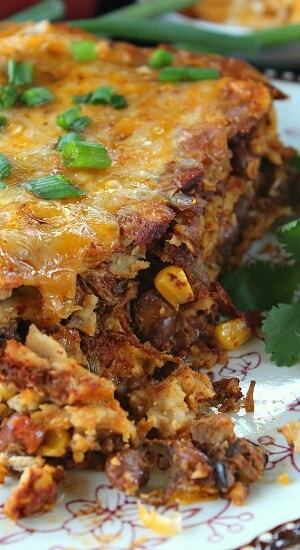 Cover with foil and bake for 45-50 minutes or until cheese is melted and enchiladas are hot throughout. Garnish with sour cream, olives, green onions.